...for considering North Adelaide Baptist Church as the venue for your wedding ceremony. 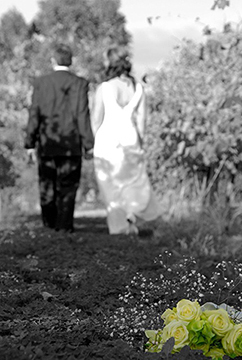 We look forward to helping you make your special day one that you will cherish. You do not have to be a member of this church to be married here. Nor do we expect you to attend to be eligible. Of course, if you wish to, you’re always welcome to join us for worship (Sunday mornings at 10.00). We’d be delighted to see you. If you choose to have your wedding here, however, it will be conducted as a service of Christian worship. That doesn’t mean it has to be stuffy, boring, irrelevant or unconnected to your life. There is some flexibility available in planning the service. Feel free to talk to the minister about what you would like (or not like) and what might be right for you. The one requirement that we do ask is that you have completed a Marriage Preparation course. Let’s face it… marriage is a big step. It involves commitment and work. There are also many pressures on couples these days. So, it is important to take the time to reflect on your relationship and on how you can continue to grow –– individually and as a couple –– over the course of a lifetime together. A Marriage Preparation course can be done with the minister of this church, which is a good way of getting to know the person who will be marrying you. The Federal Government also requires you to complete a form — a “Notice of Intended Marriage” — at least one month and a day before your wedding. This form needs to be witnessed, normally by the minister marrying you. You will also need to provide your birth certificate and, if you have previously been married, a copy of the Death Certificate or Decree Absolute. The course of Marriage Preparation done with the minister will cost $150 (which includes computer processing of a questionnaire). In addition, the church has a flat fee of $700 for wedding ceremonies, with a $100 deposit to be paid when the booking is confirmed. The balance should be paid prior to the wedding, either to the minister or the caretaker. Unfortunately, we are unable to provide floral arrangements for the church. Your family may organise them themselves or you may choose to use a professional florist. Please note: if you wish to use pew decorations we ask that you do not use any damaging fasteners. Photography and videotaping may take place inside the church, but those appointed will need to liase with the minister. Use of flash during the service is normally not permitted. We also ask that confetti and rice not be thrown anywhere in the church or on the church property. To make a booking or to enquiry about availability please contact the Caretaker. For any other information, please don’t hesitate to contact the minister.